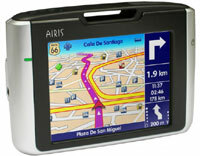 Route 66 Airis T920A (air-r66n7-ireuk) €0.00 including FREE DELIVERY - buy online at mysatnav.ie Ireland - FREE SHIPPING. It is hard to beat this system on price and value for money. The Airis may lack the 'finish' of other brands however here are a few reasons why we like the Airis so much. Reliability. This GPS is very robust with very few problems. Ease-of-Use. The Route 66 software is excellent and has one of the easiest street searching functions that we have come across. Customer Feedback. Nearly everybody we talk to after purchase are very happy with the performance of the unit. When you buy the Airis T920A from us you get the latest mapping for Ireland as soon as it becomes available.